The Miss Europe pageant 1975 would at first be held in Lebanon. This was not for the first time the Miss Europe would be crowned outside of Europe. It was also not for the first time the pageant would be held in this middle eastern country, the pageant was held over there from 1960 – 1964. There was one only one issue in 1975 that made Lebanon not as suitable for a pageant like it was in the early 60’s. Politically the country was not very stabile in 1975 and therefore the Miss Europe organization in Paris decided to stop the preparations and they started to look for another host country. Funny detail: some of the pre-pageant activities had already started. On te picture with this article we see 5 beauty queens who would represent there country at the up-comming Miss Europe pageant: From left to right: Miss France, Sophie Perrin, Miss Holland, Lynda Snippe, Miss Luxembourg, Theresa Manderschied, Miss Switzerland, Beatrice Aschwanden and Miss Belgium, Christine Delmelle. 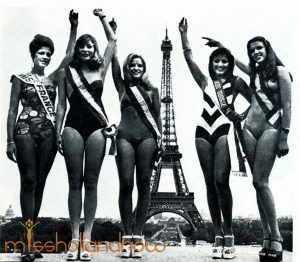 The 5 were in Paris to start the promotions for the Miss Europe 1975 pageant. One of the countries that was asked to host the issue Europe 1975 pageant was the Netherlands. Ria van Meeuwen, from the Miss Holland committee started negotiations with at first the TROS broadcasting company and when they refused with AVRO broadcasting company. The Tros already broadcasted live the Miss Holland 1973, 1974 and 1975 pageant. They were very disappointed with the ratings of the 1975 pageant and therefore were not interested in broadcasting another pageant that same year. The AVRO, who at first looked very interested, also declined and so in the end there was no Miss Europe on dutch television and in the end the Miss Europe pageant was completely cancelled for 1975.